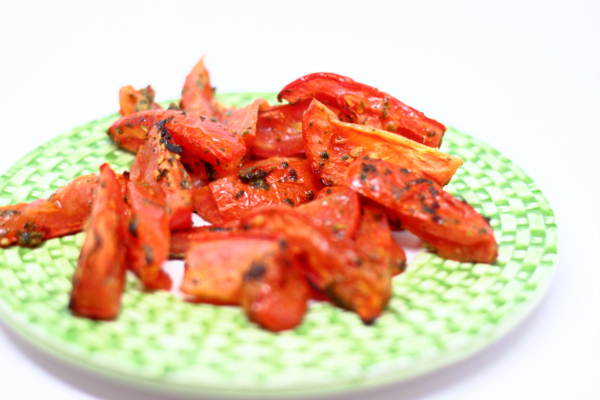 Warmed tomatoes are so flavorful – the heat just sweetens them and intensifies the already great taste. 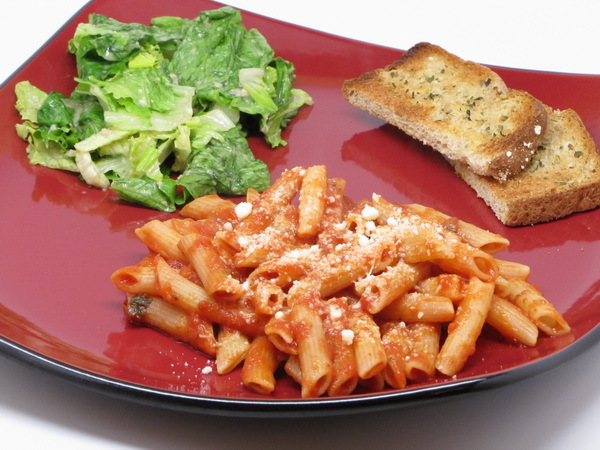 Add a little pesto and you get a divine side dish that can be served next to anything. Preheat oven to 400 degrees and spray a baking sheet with Pam. 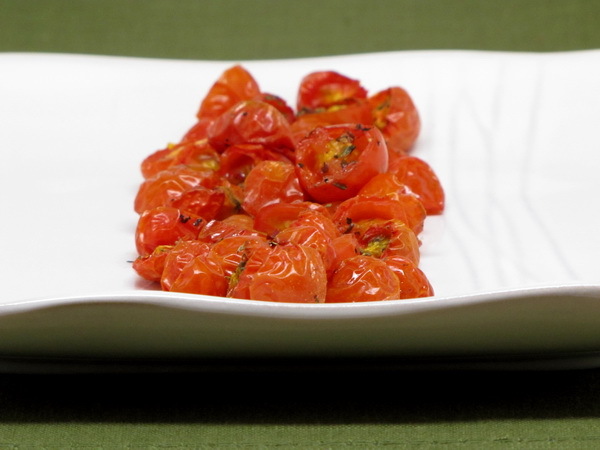 Mix the tomatoes with oil, salt, pesto and the pepper flakes and place on baking sheet. Bake 30 minutes and serve immediately. 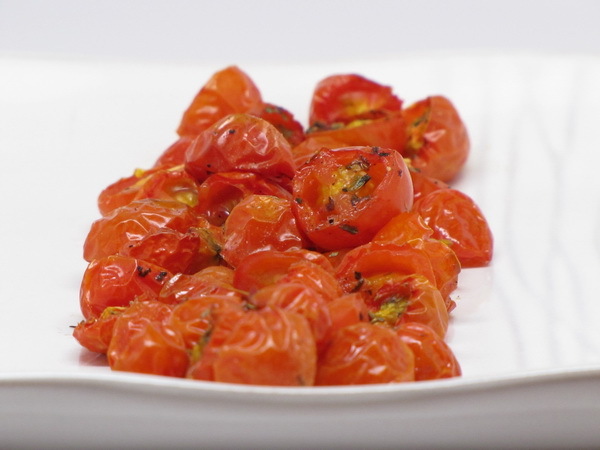 Roasting tomatoes gives them a whole new taste – they become earthy and really savory. They make a meal feel special and there’s no easier recipe ! Preheat oven to 350 degrees. Spray a baking pan with Pam. Slice the tomatoes in half and lay on the pan. Sprinkle with salt and pepper. Roast uncovered for 1 hour. If you like them kicked up a bit, add some onion powder, garlic powder, cayenne pepper, etc. before roasting. 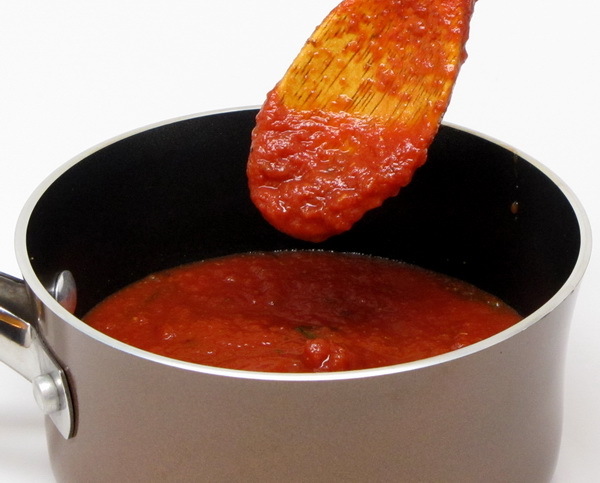 But I prefer the pure taste of tomatoes in this recipe. I can’t resist – here is another picture of the tomatoes – I just LOVE the color ! Cut peppers lengthwise into quarters and place all veggies on a broiler rack or on a wire rack atop a baking sheet and brush them with 1/2 c of the dressing. Broil 6-8 minutes turning and brushing a few times with the another ¼ c of the dressing. 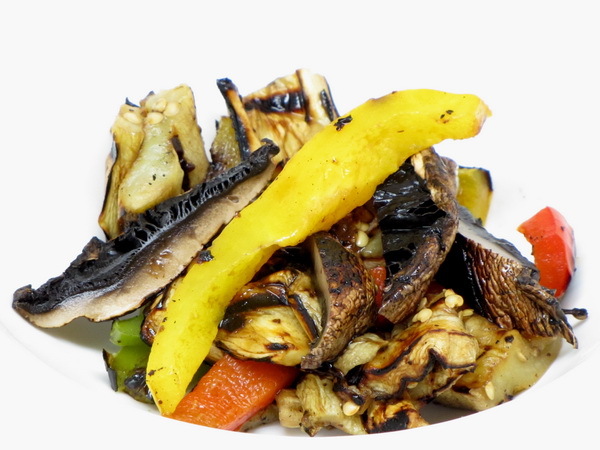 Slice mushrooms and mix all ingredients together and dress with the last ¼ c of dressing.